1. Ming Wei has been actively seeking and investing in collaboration with academy from year 2000 for development and improvement in corrugated cardboard making equipment. 2. In July 2001, Ming Wei started to implement this advanced scheme with "National Yuulin University of Science and Technology ( NYUST)". 3. 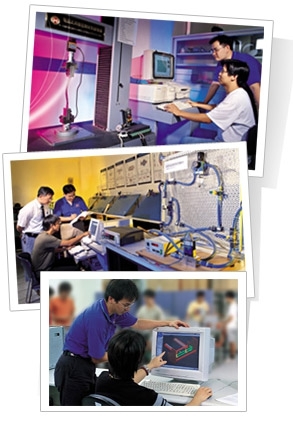 To acquire an optimum solution for modifying our existing equipment, we analysis mechanical construction with testing and report under NYUST's professional computer and experiment instruments. By obtaining the internal parameter of key spare part, we know the curial method improving design. 4. Ming Wei is the first and the only company in our field in Taiwan cooperating with academy, we do not hesitate to invest founds for developing and raising our equipment quality to ensure the best service for our customers through the continuous and successful results with NYUST, Ming Wei becomes a model in the mechanical industry.